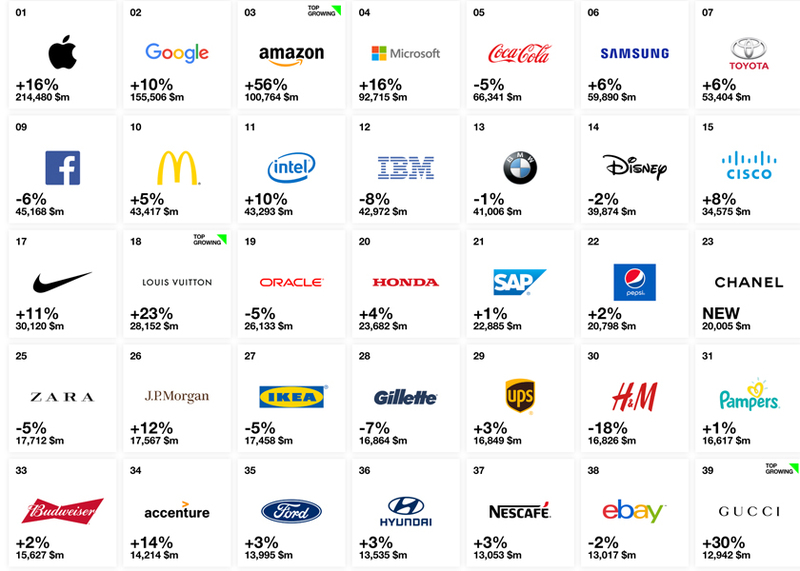 This is the sixth consecutive year that Apple and Google hold the top positions; Apple’s brand value grew by 16%, and Google’s brand value by 10%. Amazon achieved 56% growth and is the third brand to achieve a 100 billion dollar brand valuation. The list also features two new entrants, Spotify joining at #92 and Subaru at #100. More than half of the Best Global Brands came from five sectors: Automotive, Technology, Financial Services, Luxury, and Fast-Moving Consumer Goods. Luxury is the new Top Growing Sector in percentage terms, pushing Retail to second place.